BOAO, Hainan, April 10 (Xinhua) -- Chinese President Xi Jinping unveiled new measures for expanding reform and opening up Tuesday as China marks the 40th anniversary of the policy this year, heralding "a new phase of opening up" for common prosperity of both China and the world. "China's reform and opening up meets its people's aspiration for development, innovation and a better life. 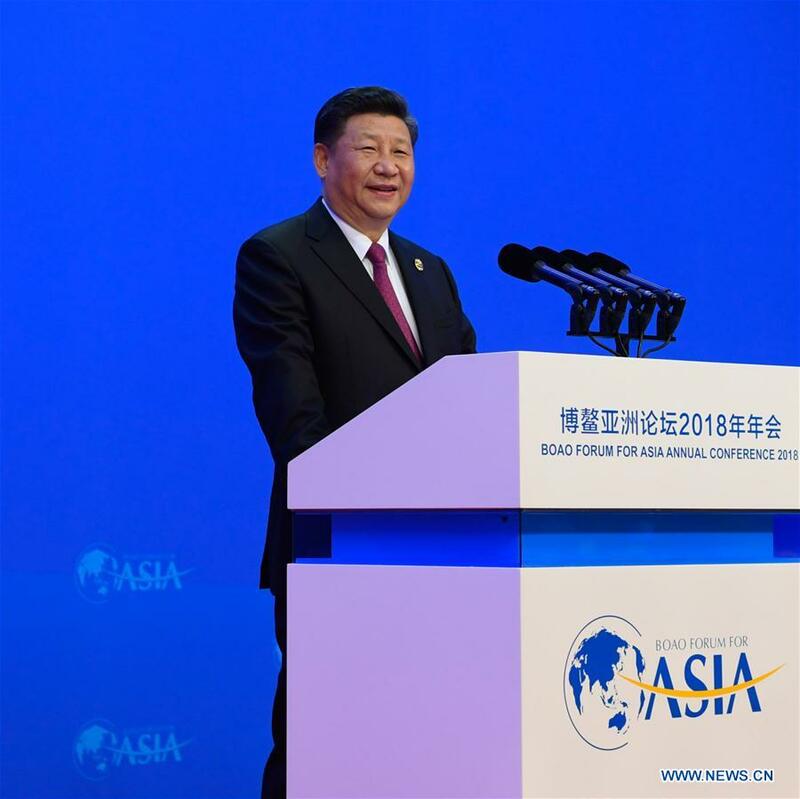 It also meets the global trend toward development, cooperation and peace," said Xi when addressing the opening ceremony of the annual conference of the Boao Forum for Asia (BFA) in the southern island province of Hainan. This is Xi's first major diplomatic event in China since he was unanimously re-elected Chinese president in March. The landmark Party congress in October revealed the roadmap for China's rejuvenation, laying out a two-step approach toward "a great modern socialist country" and heralding a new era for socialism with Chinese characteristics. The reform and opening up, initiated by Deng Xiaoping in 1978, has significantly unleashed and enhanced productivity in China, blazed a path of socialism with Chinese characteristics, demonstrated the strength of the nation, and actively contributed China's share to the world, according to Xi. Hailing it as "China's second revolution," Xi said the reform and opening up had not only profoundly changed the country but also greatly influenced the whole world. As the country's helmsman, Xi launched the new round of reform and opening up, the largest in scale around the globe, at a time when the giant vessel of China has entered "a deep-water zone." "Humanity has a major choice to make between openness and isolation, and between progress and retrogression," Xi said. "In a world aspiring for peace and development, the cold-war and zero-sum mentality looks even more out of place." Singaporean Prime Minister Lee Hsien Loong said Chinese leaders and officials had declared China's determination to liberalize further recently. "Today I was very glad to hear President Xi Jinping reaffirm this and announce further steps in financial sector reforms, in opening up foreign investment rules, in protecting intellectual property, and in increasing imports in order for China to go further in this direction," Lee said. China has every intention to translate all the major initiatives of opening up unveiled Tuesday into reality, sooner rather than later, Xi declared. "We want the outcomes of our opening-up efforts to deliver benefits as soon as possible to all enterprises and people in China and around the world." "China's successful exploration and practices in reform and opening up have offered a new choice for humanity as the world is at a crossroad for development," said Chi Fulin, head of the Hainan-based China Institute for Reform and Development.